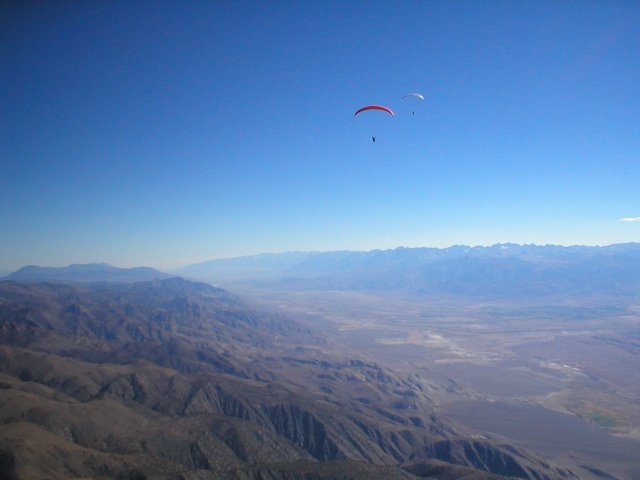 Doug and Dave are in California this week to compete with the big boys in the very big air of the Owens Valley. It sounds like the weather is cooperating to deliver some really epic conditions. I don't think our boys are planning to document their daily adventures in detail, but we can follow along with the results posted at the official site, and with blogs by other pilots who are posting daily reports. If anyone hears any interesting news or finds any other links, please make a comment here. Go Team Hawaii! firedave: over here in owens valley with doug. I Get a practice day before the comp starts for real tomorrow. Giddy up! firedave: nats task 1 110k many made goal. I sunk out after launch conditions went bad. Damn it was another great day. Doug had the same fate. firedave: nats task 2 112k two point downwind run. Launch early, going good. Task cancelled because of supposed approaching gust front that never comes. doug: Dave and I both ended up launching late yesterday and did not get up. Today we both climbed out and the day was canceled due to high wind. firedave: nats day 7 called on strong wind aloft. A Bunch of us boogie to marshall for the glass off. I damage dougs rental off roading. Nice BDay gift. Well I am back home and just thought I would report some of the action from Owens this past week or so. Doug headed out on Wednesday as scheduled, I didn't leave until Friday, as I had my tonsills taken out a few days before and Friday wasthe lastday I could leave and still make the Nats. I called Hawaiian Air twice to make sure my oxygen cylinder could go. When I get there the agent freaks out and will not let me check it in. The irony is that Patti mails it to me the same day, air mail and it arrives a few days later. Doug didn't say anything and his went on no problem. Whitney. The boys have been flying 100 milers off there the past few days and we want some of the action. The buzz in town says the Gunther Launch is the ticket and we head up there. Meanwhile, a bunch of guys goes to Walt's and puts in 100 miles. Honza even toplands near the top of Mt. Whitney. Runs up to the top takes a picture, relaunches and flies a hundred. All week long Honza and Nate Scales put in some insane flights on days that noone else would fly, very inspiring. Doug and I and a few dozen others launch Gunther, we find beautiful thermals everywhere, I put in about 20 just testing myself after surgery and being sick and try to keep it low, below 15 grand at least. Doug and everyone else crank some miles, a few guys were at close to 20 grand. I am stoked, but would like oxygen. Sunday, the first day of comp, the meet director forgets to get a permit for Gunter launch so we all head to Flynn's. Flynn's is much lower than Gunter, they say you have about 10 chances to get up at Gunter, you have about two to get up from Flynn's. I say I am launching early but somehow Doug and I find ourselves at the end of the line. The wind goes from zero to 20 in about 30minutes. Gliders are dragging all over the place, and by the time we launch it seems that the lift is all shredded up, I can't find anything to turn in, scratching hard, window opens and figure I will try my luck downwind, I meet the ground a couple miles later. I see Doug ahead of me land at the LZ and miss the relaunch window. I am pissed, it is like a repeat of my first day at Lakeview last year and I don't like it. But, the forecast looks good for the rest of the week, so I figure I have my work cut out. Doug and I head over to goal some hours later and watch 35 guys (and girls) finish 110k of epic flying. I feel guilty drinking beer, even though we provided it. Day 2: Flynn's again, 112k task called, Doug launches first and I launch shortly thereafter. We get up, but someone erroneously reports a gust front coming up down valley, launch gets closed and the task is cancelled. I am high, but watch almost everyone land shortly therafter. I am torn and thermal for a while, happy to be high and figure I will be a sheep and go land. Honza, Nate and friends fly the task anyway and report great conditions. Day 3: Flynn's again, even though we want Gunter, as to avoid the low down valley flow. 48k task called, 50 pilots launch, about 3 pilots get above launch, 47 scratch like idiots for a while, wind picks up and the task is called again. Day 4: Finally we get the green light to use Gunter Launch. 112k task called. Launching is stress free. Doug and me launch from off the road between cars, easy as pie. I go off into a nice cycle, climbing with gliders from about four different launch spots. A call goes over the radio about a glider flying without a pilot. I look around for a while until I realize that the glider immediately to my left doesn't have anyone in the pod harness. It is flying beautifully almost out climbing me going straight. It takes about 10 minutes for the glider to turn downwind and go down around the back of the hill, truly amazing. The pilot, Greg Babush, forgot to clip in to the leg/chest straps on his harness, got picked up and bailed at about 10 feet, injuring his ankle. Task starts. I head out with Doug already well above. I end up on a more out front line, with the thermals pumping well. Coming around Boundary Peak, the last mountain before the range peters out, I start not finding lift, I keep moving on to the next spine but can't find a climb. 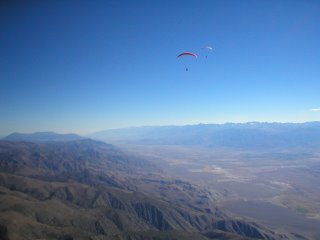 I end up about 200' over the valley floor, my day over, when I hook a rodeo ride thermal with a 70k ground speed, I have visions of riding it to the clouds 12 grand overhead, but 700'up I get bucked one final time and lose it for good. I glide another few miles with a stout vally wind and make it into Nevada for 50k. Doug on the otherhand, goes over the top, sees the leaders struggling under heavy cloud cover and starts racing from up high. He passes lots of people and gets goal in 13th place. A truly respectable performance considering the talent of the average pilot there. Day 5: Gunter launch. The wind picks up as launch time approaches, the poor wind techs get an e-ticket ride in the very strong winds. The day is called and we all head down, except for Honza. He pulls up into an almost 90 degree off ideal, nuking wind, into what looks like insane rotor conditions. He wobbles off the hill, finds a thermal out over the valley, and goes circling away on a 50 miler into a direction that he wanted to explore. Awesome. Doug, Kari Castle, Cherie Silveria, Josh Cohn, Eric Reed, a host of others including Alex Colby's evil twin from Vancouver named oddly, Alex and myself head to the Owen's River Gorge for some excellent rockclimbing. I am impressed by the quality of climber that most PG pilots are, with Doug being our only newbie. Everyone does great and we climb out of the Gorge in the dark. I have to add that almost every day ends with a soak in the abundant wild hot springs dotting the valley. Mexican food, beer and hot springs, the recipe for deep sleep. I love this place. Day 6: Task called becauseof high wind aloft. Downhill mountainbiking at Mammoth is the call for the day. I just have to say, if you haven't tried it lift serviced downhill only mountainbiking is nuts. It is 37 degrees on the summit and blowing 30 mph. We are in t-shirts and shorts, I have forgotten gloves. Once off the summit things warm up, stellar views abound and the riding is insane. Doug suprises me with his ability on the downhill, taking some big drops. We escape injury, but wind up exhausted. But beer, food and hot springs finish me off. Day 7: Task called, we leave town, boogie off to Marshall in San Bernadino for the evening glass off. I manage to rip a hole in the oil pan on Doug's rental car and we repair it with some epoxy in the dark. We end up crashing at the Andy Jackson Flight Park LZ. The next day I head off to the in-laws house. Doug heads back to launch and flies for a while, getting as low as 100' over the LZ before climbing back up above launch. Sounds like fun.